While sports betting is one of the most popular forms of gambling around the world, the US has yet to fully embrace it. There are only four states that are allowed to have legal state-sponsored betting, leaving the other 46 without any domestic options (like brick-and-mortar sportsbooks or through the state Lottery). However, USA bettors are able to legally place sports bets with licensed offshore sportsbooks. 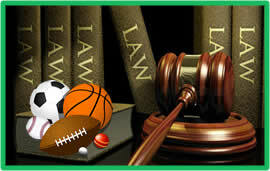 In regards to domestic sports betting, there are several federal laws in place that set the tone. These laws include the Professional and Amateur Sports Protection Act (PASPA), the Federal Wire Act and the Unlawful Internet Gambling Enforcement Act (UIGEA). This page was created to inform US bettors on the different laws surrounding the American sports betting industry. We have pages dedicated to each of these three laws, breaking down what they mean and how they affect US online sports gambling. There is also an FAQ section with additional information for you to think about if you live in the United States. There are three primary federal laws governing gambling entertainment in the United States. A concise understanding of these laws allows USA residents to make informed decisions regarding involvement in sports gambling entertainment. Following you will find a brief overview of each law and access to a more in depth explanation of the laws and what how they impact the US sports gambling market. The Professional and Amateur Sports Protection Act, or PASPA, is a federal ban on sports betting that blocks 46 states from licensing state-regulated sports gambling businesses. This law prevents any physical sportsbooks in these states and state Lottery sports betting options. You can find more information on the law on our PASPA page here. The Federal Wire Act is the oldest of the three laws governing sports betting and has also been the most open to interpretation. This law originally applied to gambling via wire transmissions back in the early 60s and has since expanded to include all forms of online gambling. A Formal Opinion issued by the U.S. Department of Justice back in 2011 deemed the law to only apply to US-based online sports betting, thereby allowing domestic online gambling forms like casino games and poker to surface. You can find more information about this law and the DOJ’s influence on it on our page dedicated to the Federal Wire Act. The Unlawful Internet Gambling Enforcement Act (UIGEA) is the newest of the three laws and deals with the financial side of online gambling. This law pertains to banks and other financial institutions in the United States and how they process transactions via online gambling. This law doesn’t target individual bettors, but rather illegal financial practices present in unauthorized sports gambling sites. You can find more information on the UIGEA on our page dedicated to the law here. Which States Are Unaffected By PASPA? Oregon, Montana, Delaware and Nevada are the only four regions in the United States that are exempted from PASPA. This is because all four states already had some form of sports betting in place at the time of the bill’s passing. The other 46 states are barred from having licensed sportsbooks. What Did The DOJ’s Formal Opinion Do For The Federal Wire Act? Prior to the DOJ’s input, the Federal Wire Act was considered to apply to all forms of domestic online gambling. This meant online US-based poker rooms, casinos and sportsbooks were restricted from being licensed in the country. After the Formal Opinion was issued, the law was clarified to only pertain to domestic online sports betting, allowing for US-based poker sites and casinos to emerge should states choose to establish them. Will Sports Betting Ever Be Legalized In The US? PASPA would have to be repealed for there to be a chance of sports betting becoming legalized. There has been some momentum involving several states pushing for the right to legalize sports betting, but nothing significant is expected to happen until 2018 at the earliest. How Can I Bet on Sports Legally Within The US? You can legally engage in sports betting in the US by one of two ways. You can take a trip to Vegas and use one of their state-regulated sportsbooks or you can bet with legally sanctioned offshore sportsbooks. Either option is exempt from federal law. The sportsbooks featured in this guide are all legally licensed and regulated offshore. What Are Offshore Online Sportsbooks? Offshore sportsbooks are online sites that operate in a jurisdiction outside of the United States that has expressly legalized and regulated sportsbook gambling within their respective territories. Their offshore stance leaves them outside the jurisdiction of US federal laws. There are also no US federal gambling laws that indicate betting with licensed offshore sportsbooks is illegal. Do These Laws Target Individual Bettors? PASPA, the Federal Wire Act and the UIGEA aren’t designed to target individual bettors, but rather the institutions facilitating sports betting. These laws block states from hosting sports betting through brick-and-mortar sportsbooks, US-based online sportsbooks from accepting wagers from Americans and banks from processing transactions stemming from illegal online gambling activities. While someone who violates these laws could face some fines and/or a small amount of jailtime, the actual enforcement of these laws is pointed towards the larger parties involved. New Jersey was the first state to pass legislation that legalized sports betting. Their decision was met with swift action from the major professional sports leagues and the federal government resulting in a suspension of the law. New Jersey has been appealing the ruling and has lost several times. The case currently resides with the Supreme Court and is in a waiting period. New Jersey is arguing that sports betting should be a state right and not left up to the government. If their case is heard and the ruling is in favor of New Jersey, the American sports betting landscape could change forever.